We want to honor our 2019 U12 Championship Flyin Ryan Hawks Foundation Flyin’ Ryan award recipients. George Walker of RED Mountain Resort (and Australia) and Riley Combe of Team Breckenridge Sports Club. George was all out cheering for other competitors from the start gate. He was hooting and hollering for nearly all the riders as they dropped in. A competitor a few slots in front of George didn’t have a coach at the top and George jumped right in, whacking this gentleman’s ski boots to help remove the ice before he clicked into his bindings. George had the misfortune to lose a ski mid-run on his Finals Day run. 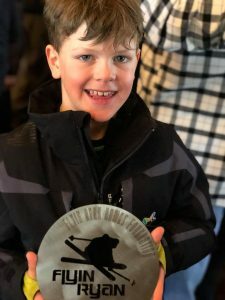 An IFSA representative served as his Ski Ninja/Ski Dude and, though flustered, George kindly thanked the IFSA rep and skied to the finish corral. Later in the afternoon, George again thanked the IFSA rep. George didn’t have the run he hoped for, yet he demonstrated a fantastic amount of sportsmanship, good vibes, and a wonderful sense of camaraderie with the other competitors. George is a fantastic example of everything that is wonderful about our Freeride community. The IFSA and the Flyin’ Ryan organization wishes him a safe return to Australia this week. Riley Combe threw down a great run on Day 1, landing herself solidly in 3rd place. She was in a great position to crush her run on Day 2 Finals. Riley unfortunately kicked a ski about halfway down the venue. The ski shot down to the very bottom in a depression below the finish corral. Riley gave it her ALL to get to that finish corral with one ski. She put her heart and soul into getting to the bottom of that venue with one ski on and she was received with cheers, hoots, and hollers as she pulled into the corral. 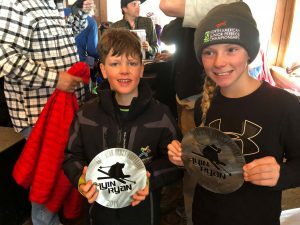 Both Riley and George were wonderful examples to our U12 Freeride community and we are grateful they came out to share their enthusiasm, spirit, and love of the mountains in our U12 Championship event.